It’s the classic recap of the past year! This is each of our Top 5 Board Games from 2016. Keep in mind that this is based on games we’ve been able to play this year. There are definitely some honorable mentions that did not make the list for various reasons, but the most likely reason is because we were unable to play the game enough to judge it. After recapping what games I’ve played this year, I had a hard time figuring out which ones would make the cut. The past year was great for board games, and many with hype that, for the most part, the games lived up to. Starting to write reviews has really helped me figure out what I enjoy from a board game. Another plus is that I get to play more games and justify buying new ones despite Mandee’s occasional dirty look when a box shows up full of games. We have a lot more games that we want to review in 2017 so maybe this list will change within the next six months. Vikings, monsters, and Ragnorok? How could anyone say no to a game that has all those things in them? Blood Rage is an area control game with awesome components and really fun game play. The amount of replayability in this game is good due to the card drafting, which allows players to try out new strategies every game. It also has some awesome combos that can be pulled off for some massive points. This game has a lot that I really enjoy with tense moments battling for Yggdrasil and rewarding players for being aggressive, which keeps the game moving along really nicely. The only issue I had with this game was that there could be a runaway leader problem with not a lot of catch up mechanics in place for players to recover from a bad start.I’m looking for an opportunity to play this game, and have enjoyed it every time. Scythe takes place in the future that combines mechs, farming, and controlling the lands of Europe. Like Blood Rage the components in this game are top notch, accompanied by great game play. With five different player boards and five nations to choose from, there’s a ton of combinations you can try out before the game gets old. Each game starts off somewhat similar depending on what nation you are, but it quickly branches off into different areas for players to explore their strategies. This game would probably be a little higher on my list if the playtime wasn’t as long as it is with a higher player count, which has made it somewhat difficult to get to the table. 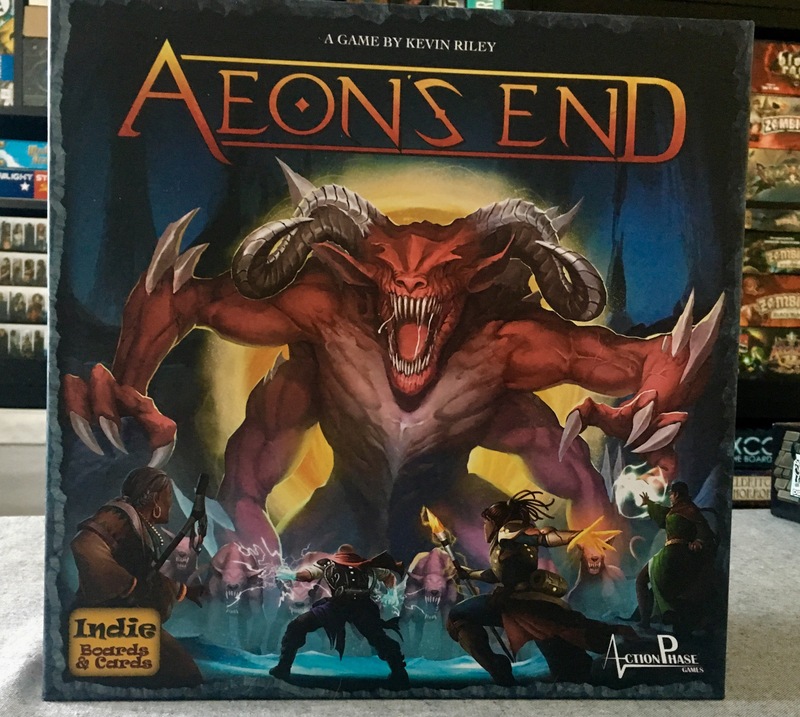 Aeon’s End is a cooperative deck builder game that pits players against a big bad monster that is trying to destroy the town of Gravehold. Players take on the role of mages as they try to defeat the monster before it destroys the town. This game is really challenging, which is something I really enjoy in cooperative games because it forces players to coordinate with each other to succeed. Aeon’s End provides a good amount of ways for players to assist each other by allowing them to power up spells or even cast other players spells when it’s not their turn. One of the more unique things about this game compared to other deck builders is that turn order is randomized every round, which adds suspense to every turn. This makes it a little random, but with players having twice the amount of turn cards in the deck, it still allows cool combos to be developed between players. I’m looking forward to playing this game some more and writing up a review in 2017. In Vast: The Crystal Caverns players will take on one of five roles and compete to be the first one to achieve their goal. It was really exciting to try out every role in this game and see how they interact with other roles in the game. The rule book is helpful by providing every possible combination to play with special rules for each one. Vast: The Crystal Caverns is definitely one of the most unique experiences we’ve had in board gaming since we’ve started getting more into this hobby. It’s not very often that there are so many unique roles that mix so well with each other. Who would have guessed that terraforming a planet could be so much fun? Terraforming Mars is a game that we got later in the year that made a really good impression on me. The game has everything that I like from unique player powers to developing a big point engine. At the end of every game I’ve played, I just have a feeling of achievement as I look over the engine I’ve created and the result of our terraforming of Mars. With a couple different variants to try and twelve different companies to try, this is a game that we’ll be playing well into 2017 and more. My top 5 consists mostly of games that I was genuinely surprised to love – either because the theme is not my first choice or the style of game typically doesn’t do it for me. Maybe my game tastes are evolving, or maybe these games are just that great. All I know is that 2016 had so many great games that this list was very hard to create. The Networks integrates a strong theme into easy to understand game mechanics. With a number of options of TV shows, stars, and ads to choose from, there’s a decent amount of replayability. And it’s funny – the names of the shows are homages to existing shows and it’s fun to figure out the references. On top of that, I’m a TV fanatic so being able to control my own nightly lineup is very appealing. If I had to make one improvement, it would be to control more than one night of TV. The theme of Vast: The Crystal Caverns is so strong, that it’s hard not to love this game. When you play as a character, every action you take makes sense with the behaviors and characteristics of your character. On top of that, it’s rare that an asymmetrical game where each character has a different goal is so successful. It’s an interesting concept, mixed with an interesting theme. I strongly dislike space-themed anything: movies, books, TV shows, and board games. So I was set to not enjoy this game, but I was quickly proven wrong. Terraforming Mars perfectly integrates the theme of making a new planet livable with game play and mechanics. I do not typically do well with engine builder games, and this one is no exception. Even though I am terrible at this game, I still think it’s great. Scythe is an incredibly successful and well-balanced game, while combining two of my least favorite things (farming and combat). Yet I still love it. This game is fantastic and one of my favorites from 2016. The components are amazing, the game play is always surprising, and every game feels different. There’s enough suspense and strategy to the game to appeal to anyone interested in a heavy-Euro game. It can be a bit long, but it’s still a great game to bring out to the table. Yet again, The Others surprised me. I typically do not enjoy combat games or one vs. all games, but my experience playing this game was so great, that it is my number one game from 2016. I love how much replayability this game has and how well it integrates the theme into the game play. And, unlike many other one vs. all games, you feel like all of your actions really matter. This game is always a toss up as to who is going to win. I love this game, and I can’t wait to play it again. Next Post Game Review – Clank!